The blackbirds that fell out of the sky on New Year's Eve in Arkansas were brought to the National Wildlife Health Center lab in Madison, Wisconsin. After examining the bodies, officials say they've determined a cause of death. 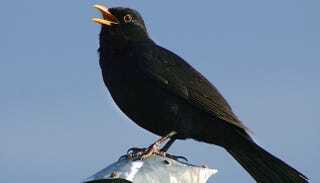 The cause of attention to the blackbird die-off was good timing. At midnight on New Year's Eve, starting the countdown to the fateful year of 2012, a town in Arkansas sees birds fall out of the sky. It sounds like the opening to a decent horror movie, in which the hero is the only one who can connect all the fateful events and sees the horrific outcome. The cause of the actual death was much more prosaic. The birds died from blunt force trauma. After their deaths, they were gathered up and sent to the National Wildlife Health Center in Madison, Wisconsin. Employees there found bruises on their bodies and not much else. The lab was not impressed with the timing of the event, since its researchers analyze as many as 500 mass die-offs per year. The fact that the birds showed bruises, that they were the only species that was part of the die-off, and the timing determined the death. Scott Wright, the chief of disease investigations explains, that firecrackers would have set the birds out at night, flying blind. It's believed that the noise startled them-they are poor night fliers-and they were in close proximity to neighborhoods, and they flew into homes and cars. They died of impact force to their bodies. They believe the mass death of fish in a river elsewhere in Arkansas is unrelated.